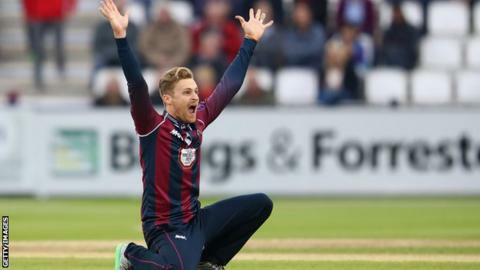 Graeme White's career-best six-wicket haul helped Northamptonshire comfortably beat Lancashire by 76 runs in the One-Day Cup at Wantage Road. The hosts were reduced to 37-3, but a 137-run stand between Ben Duckett (98) and Rob Keogh - who hit a List A career best 66 - helped them finish on 287-8. In reply, Lancashire lost Jos Buttler for two and Alviro Petersen for three. Despite half-centuries by Luke Procter (52) and Karl Brown (51), spinner White's 6-37 saw them all out for 211. The 29-year-old left-armer's superb spell surpassed his previous best List A haul of 5-35, as he produced the sixth-best figures for a Northants player in the format and best for 11 years. But his side was also helped, in part, to their first win of the One-Day Cup this season by some poor Lancashire batting, including Steven Croft inexplicably running himself out on 20 when he called a single which was never on.